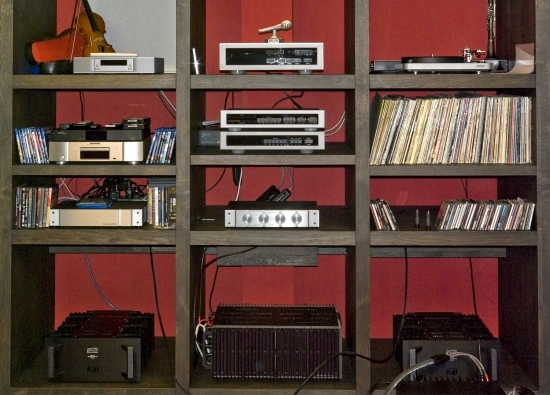 The audio world really is a small community… fortunately for me! 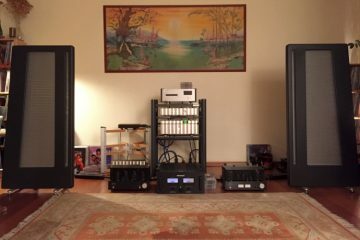 My friend Michel (who owns Apogee Divas) is acquainted with another Apogee fan by the name of Niels, who owns a pair of fully refurbished Full Ranges. Michel kindly arranged for me to visit and this was quite an experience. These Full Ranges are fully refurbished and have also got new covers that are finished in a beautiful combination of semi-gloss black and dark real cherry wood. 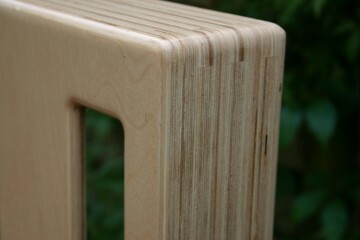 The stands are also a unique design, made by Henk van der Hoeven, the official Dutch Apogee restorer. 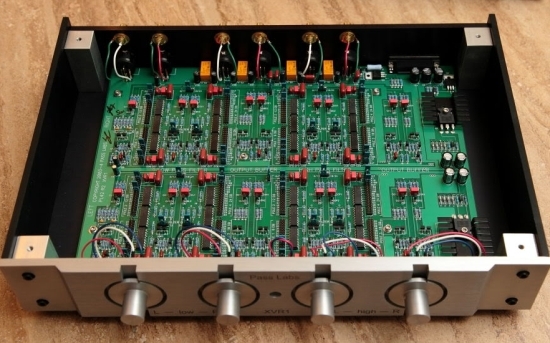 The 1.9 ohm bass foil is driven directly while the midrange and treble are connected via an external Apogee Network Box (transformer and RC network), to raise midrange impedance from an impossible below 0.5 ohm value to 1-4 ohms, while treble has an impedance in the range of 1 ohm and is only filtered by the RC network, crossing over at 5 kHz while the midrange rolls off at the same frequency courtesy of the transformer. Over the Full Range production lifetime Apogee made a few minor changes to the construction of the Bass Panel, midrange ribbon, and tweeter ribbon which affected their resistance, efficiency, and resonance but in a direct connection, the midrange is likely to be less than 0.2 ohm and the tweeter less than 1 ohm. Amplification for the bass ribbons is courtesy of a big Krell FPB-600 and mid/treble is usually driven by two mono Levinson 20.6 amps. 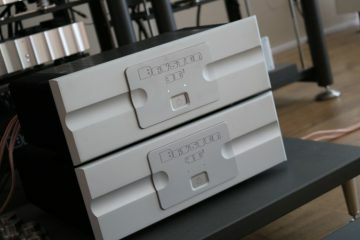 For this test, there was also a Spectral DMA-250 poweramp, which we connected instead of the Levinsons halfway during the listening session. 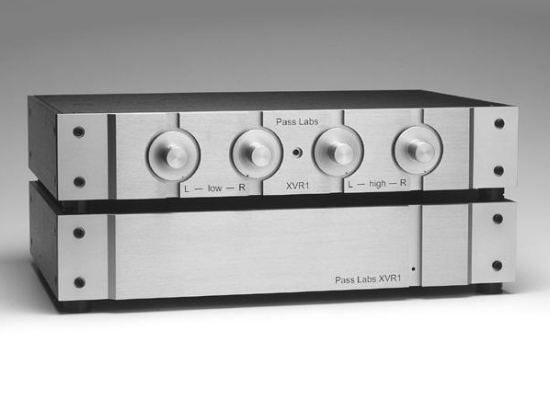 Filtering is done actively, using a Pass Labs XVR-1 discrete electronic crossover. There is no passive filtering in place for the woofer panel or midrange ribbon, only a simple 6db/octave first order filter for the treble @ 5kHz, built into the speakers. The midrange rolls off only by means of the coupling transformer. The source is a Spectral SDR-3000/SDR-2000 transport/DAC combination and preamp is the Spectral DMC30SS. Cabling is a mish-mash of standard, entry-level and high-end specimens. Power cables are mostly standard Belden and MIT (also Belden) types, interlinks are by Sun Audio/Madrigal and MIT and loudspeaker cables are a combination of MIT and Kimber. 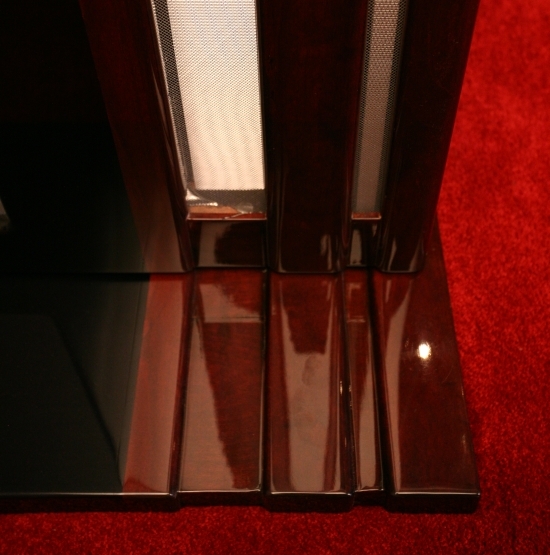 The components are all set up in a custom-built highly sturdy wood veneer over a fiber-board cabinet. First impression (with the Levinsons driving midrange and treble) is of a full, warm, smooth sound with zero aggression. The balance is slightly dark but there is no apparent treble ceiling, just a slight lack of air, which only takes a few music tracks to get acclimatized to. IMHO, even if they are still not as extended and airy in the treble as the Magnepan MG3.6R or Apogee Centaur, the Full Ranges sound a lot more open than the Diva’s which I feel are a little too dark in balance. Despite their smoothness, these speakers have explosive dynamics: the sound is totally coherent and very fast, without any compression. 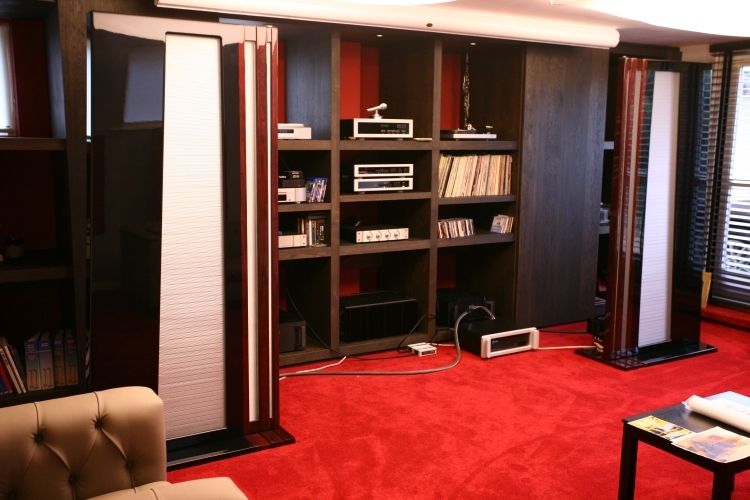 This system can play loud, really loud, but it never hurts the ears. 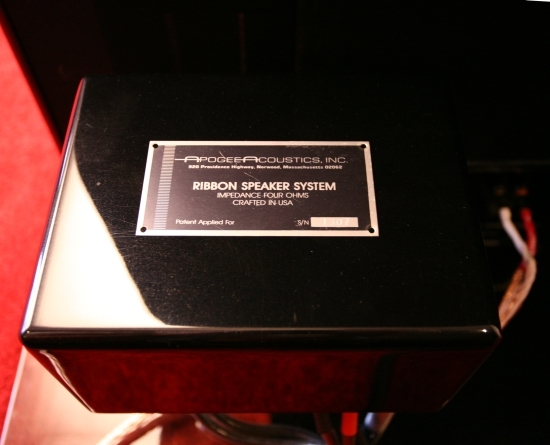 A big reason for this lies perhaps in the purity of the foils: the Full Range uses pure aluminum ribbons for both tweeter and midrange. There is no kapton or mylar backing and no damping. The bass panel is huge and goes low in a manner that can only be fully appreciated after one has heard it for him or herself. Subwoofers are absolutely not needed, not even for the biggest bass-fetishists. I was already surprised at the amount of bass coming from my refurbished Apogee Duetta Signatures but the Full Range is in another league: its bass is at once lower, more nimble and better damped than that of my Duetta Sigs which can be forward and even brittle through the midrange and treble. The Full Range, however, has treble as silky-smooth as my Magnepan MG3.6R’s. Because the latter are my reference for treble reproduction, that is really saying something. 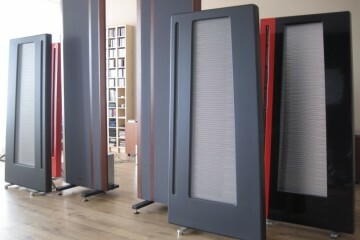 Soundstage is wide and room-filling, as I have come to expect from big dipolars such as Magnepan and Apogee. 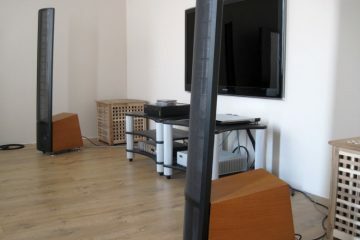 There is also good depth and sound doesn’t appear to originate from the speaker baffles. 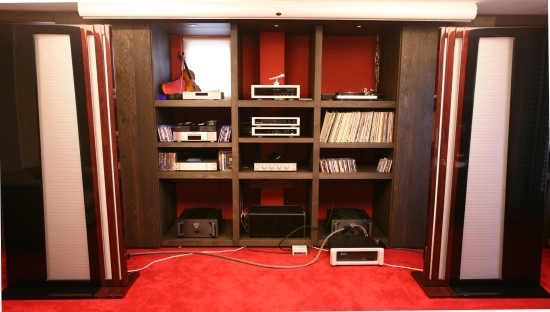 However, in this setup, there is little focus between the speakers and hardly any soundstage layering. By that, I mean that voices and instruments are as wide as the speakers are, which is in itself not an unpleasant effect, but I am just used to dipolars having better focus and layering in the depth plane. I am fully confident that this is no fault of the Full Range, which are very coherent-sounding, with zero phase problems that I could detect, but is probably 100% a function of the placement and room size. Big though the speakers are, they are set up in a room that is likely too small for them. I’d wager that when sitting 2 meters further away and moving the speakers slightly more toward each other would bring the soundstage into focus. 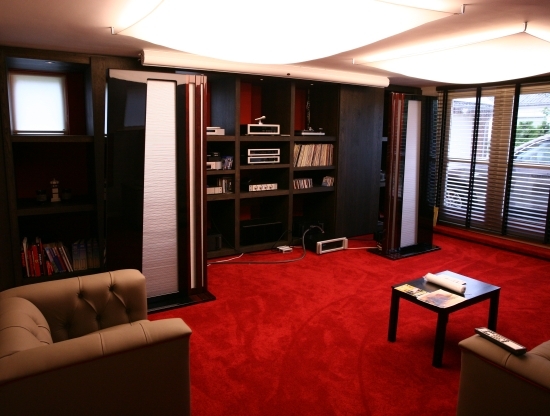 Alas, the room was built before the speakers were purchased, otherwise the owner might have chosen to make the room larger at the cost of some terrace space. If it were up to me, I’d know what to do, after all, we are living in the Netherlands and one really only needs outside space a meagre 3 weeks per year or so… But I’m digressing. You have to understand, the Dutch and the weather… it’s something of a national sport to moan about:-). Niels also demonstrated to us how versatile the Pass Labs XVR-1 is. You can’t really tell from the pictures but apart from the obvious level controls per channel per frequency band, there are numerous jumper settings possible inside. 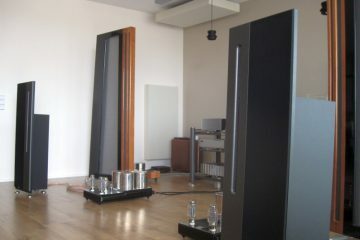 You just have complete control over all necessary settings: 1-4 poles per filter, each pole independently adjustable between 22 Hz and 18 kHz and with variable “Q”. The setting that we liked best was by means of a non-overlapping 12dB/octave filter set to 220hz for both bass and treble. 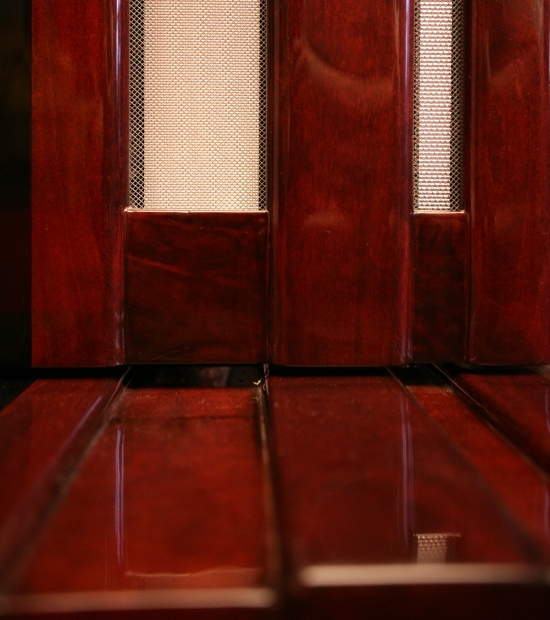 The crossover between midrange and treble is fixed at 4-5 kHz (and built into the speakers themselves). Just for the heck of it we also went back to the original Apogee Full Range active crossover filter, naturally after recalibrating the speakers again. The resultant sound was definitely pleasant but had way less resolving power, bass articulation and overall transparency. The sound now was more hi-fi-like, less authentic. Needless to say, the Pass was quickly reinstated. After swapping the Levinsons for the Spectral poweramp and recalibrating the Pass XVR-1 to compensate for amplification factor differences between the Levinsons and the Spectral, the overall character changes quite a bit. Despite the fact that the big Krell is still driving the bass panels, the bass now seems tighter and more articulate. This is of course due to the fact that bass overtones and harmonics are reproduced at much higher frequencies, making their way well into the midrange. Soundstage focus is also better and there’s a more finely resolved layering and overall, resolution is quite a bit higher, with more treble extension. The sound is still darker than my Magnepans or Duetta Sigs but there’s never a feeling of a lack of treble, just a different balance. The system still sounds glorious and smooth but is now definitely more revealing of bad recordings. Sliding up the crossover frequency on the Pass, making the bass panel reproduce more of the midrange did indeed smooth things out but also makes for less coherence so we quickly set it back to the setting previously used. The entire listening panel (3 visitors) liked the sound better with the Spectrals in place, even if the Levinsons provide a fuller, more romantic sound that also has a lot going for it. I think on balance that the Spectral is probably closer to the sound that I am used to from my Jeff Rowland model sixes. It is just difficult to give up on excellent transparency once you have heard it. 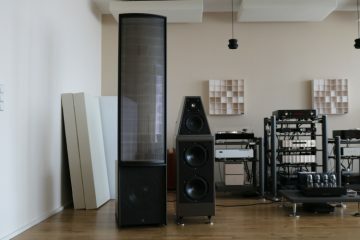 And even if with Apogees one needs to be careful not to tip over the balance into too much neutrality (that can quickly turn into clinicality), since these speakers have fabulous resolution it feels like a crime to not let them have it so I think that the Spectral is going to stay. Above: transformer unit for the below 0.5 ohm midrange/treble ribbons. Apogee Full Range – the best Apogee ever? Well, I think that they sure come close, but I haven’t yet heard all the models. For example, I am very curious about the Scintilla and haven’t yet heard the Grand. 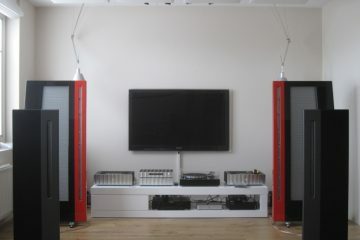 But suffice to say that if I had the funds, I would definitely try a pair of Full Range in my own setup. 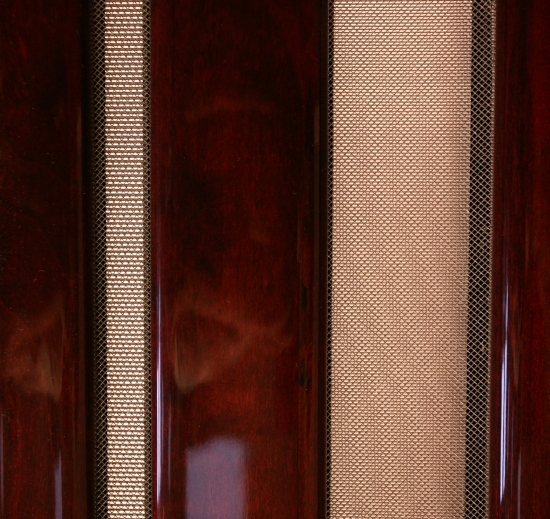 A word of caution: these are old speakers: when getting an original pair chances are high that the bass panel tension and/or damping have deteriorated or that ribbons have been damaged. 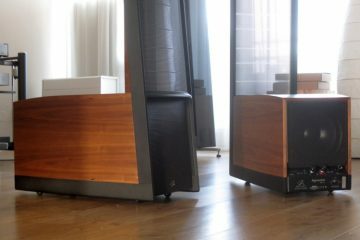 The speakers listened to here are entirely refurbished and while this can be carried out by professionals, this is a costly affair. 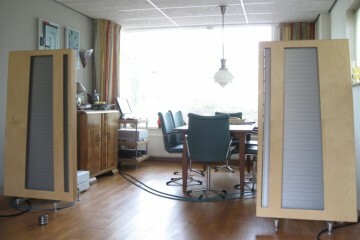 A fully refurbished pair can be had for 15.000 euro. Hardly small change, but given the results, and taking into account that current reference class speakers can easily cost triple as much, weird though it sounds, I have to say that these speakers do actually offer excellent value for money.